Have you ever been there? Have you ever had so much reason to be joyful but been too afraid to let yourself go there? My husband and I received some really good, long-awaited news this week. The Lord provided and blessed beyond any measure we could have expected. His plans are so much wilder and better than ours ever have been. And so, we’ve been rejoicing! We are often afraid to be satisfied. 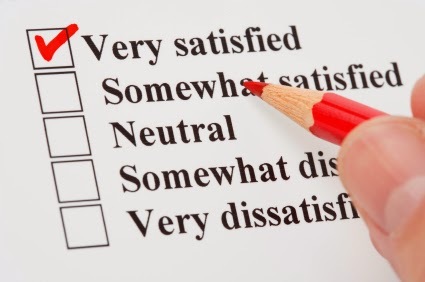 To so many of us, satisfaction sounds like complacency, or giving up. To be satisfied would lead to rest –which we confuse with laziness. Simply being satisfied requires that we accept what the Lord provides, as is, right now, without doubting or wishing or believing that maybe there could be something better. To say “Lord, your provision is plentiful” and not move on to a concerned prayer about what to do next, or another prayer asking for more...well, that’s not usually our first reaction. We’d have to put God’s plan above ours, His way above our way, and what He deems good over our fleshly desires. True satisfaction is found when our life is hidden in the Lord, and we live by His hand, with our desires delighting in Him. Real satisfaction comes when we behold His face, when we wait on Him and are guided by Him. To be satisfied, we must stop trying to fill ourselves up with more and instead drink of the water He provides (see: Proverbs 19:23, Psalm 17:5, John 6:35, Psalm 37:4). As the saying goes, the grass is always greener on the other side. When we aren’t in scorched places and it feels our bones are strong, we’re often quick to wonder if the miracle grow our neighbors use would be better than the living water. It’s not. See, our Lord doesn’t fail. He doesn’t wither away in time or depend on the balance of our conditions, our emotions, or our circumstances. We don’t have to go back again and again asking for another drink to keep us feeling full. When we think satisfaction, we tend to think of the fleeting sensation of feeling pleasantly full. There’s another aspect- one Christ wholly embodies. 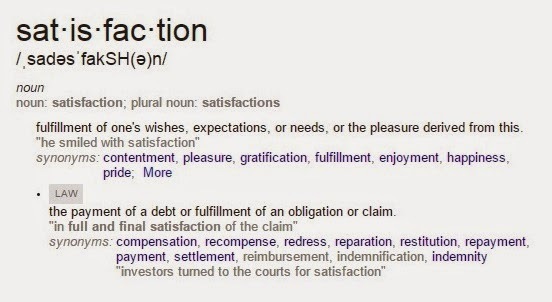 In Jesus, our debt is satisfied. In Jesus, our salvation is settled, and with that comes the fulfillment, contentment, and happiness that we associate with satisfaction. The living water is offered now. We can wait, if we’d like. We can accept the salvation of Christ and continue to live worried, live by comparison, and live to fill up our perceived lacks, waiting to find our full satisfaction in Him until heaven. But satisfaction –that is, to have enough and to delight in what you have- is available now in every way that truly matters. We may not be satisfied with our current talents, our current job situations, our current relationship struggles –but our souls can be satisfied. We can taste the living water now and drink in the satisfaction of knowing that “it is well” with our souls. We are reconciled to God through Christ. We have the assurance that we will be brought to completion, that we can trust in His faithful provision, perfect counsel, and loving friendship. Is He enough to satisfy your heart today? Live as His children. Live by His hand. Oh yes, I have been there and still experience this from time to time. I think we're often afraid for the "other shoe to drop" so to speak. There is so much truth in this post and I love how you illuminate the fact that our life through Christ is truly the only source of true satisfaction. Amen to that! Thank you for sharing and I'm so glad I was your neighbor at #RaRaLinkup today. Real satisfaction comes when we behold His face and wait on Him and are guided by Him. What beautiful and encouraging words! Like Abby McDonald I'm guilty of waiting for the other shoe to drop more often than I would like to admit. What a beautiful reminder to enjoy the satisfaction we have through the abundant life of Christ. RaRaLinkup! Thanks fr reading Abby, Angela, and Janet! Great to connect via #RaRaLinkup : ) Your encouragement is such a blessing to me! Praying that you all find your satisfaction in Him this week! !